Bilkent’s Information Office for Prospective Students, or BTO (Bilgi ve Tanıtım Ofisi), is seeking new volunteers for its Student Guides Team. 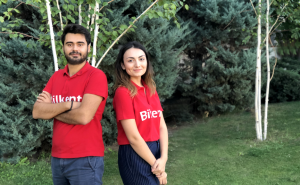 This team of Bilkent students plays a major role in providing high school students and their parents with firsthand information regarding all aspects of student life at Bilkent. Student guides organize and conduct campus tours for visiting high schoolers throughout the academic year, and also travel to education fairs held in various parts of the country. Summer tours are particularly important in helping prospective students make their decisions about university. Guides are expected only to share their experiences as Bilkent students. But to help them provide accurate information about the university, BTO provides training sessions led by experienced guides. Students interested in joining the Student Guides Team should apply to Vuslat Öztekin in the Information Office for Prospective Students, room G-10 in the Engineering building, no later than October 19. Selected applicants will be interviewed. For more information, please call ext. 3412.